How would you like to create some abstract patterns quickly and effortlessly? This script will help you achieve that. Start with any photo of your choice and run the script. That's it, or almost. 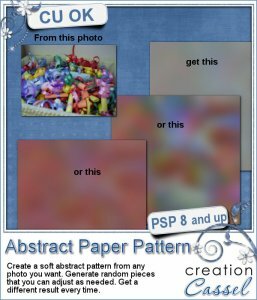 You will be able to decide how many random pieces you will want copied from the initial image and placed into a new 3600 x 3600 pixels paper, and once the script has placed them randomly, you can change the arrangement and placement of each piece to suit your taste. You can even let the script add more pieces after the first set are merged together. Once those are done, the script will randomly pick a color from the initial image to add a layer underneath all those pieces. You can keep that color or change it. Since the layers will be unmerged, you can adjust the opacity level of the top layer, or play with the blend modes to get some unique effects. Once you are happy, merge the layers and add your favorite effects, or texture. The initial image will be left untouched as the script will work using a blurred copy of it. Because of the random feature integrated in the coding of the script, you will always get a different result for every run, even if you are using the same image to start with.